RICHMOND, VA -- During a recent speech at a campaign rally in Virgina, Republication Vice Presidential candidate Sarah Palin cited the wisdom of her family members to help her craft her political positions. And apparently everyone got involved. "My rock, of course, is my husband Todd. And when he finished the Tesoro Iron Dog race with a broken arm, I knew right then he should oversee Alaska's spiraling health care costs. "When my son Track -- who, by the way, was named that because he was conceived next to some railroad tracks out there, you know, where the main road in Wasilla turns to dirt but 'tracks' with an 's' sounded kinda tacky? -- anyway, when he decided to enlist in the Army, I knew I'd be turning to him for his input on natural defense. Like the great John McCain, in the history of our g reat country next to Russia, he's also a maverick." "From my three daughters I've seen them grow up as beautiful girls, bringing their Daddy and their brother a beer without being asked and doing the laundry without any lip at all. And that's exactly how the White House should be run -- with good, old-fashioned, soccer-mom values, (whispering) although it looks like Bristol should have kept her legs on that soccer ball instead of in the air and havin' that ol' baby!" "But what's done is done, so of course we'll also be inviting Bristol's guy -- that what's his name, you know, it kinda sounds like he's some Jew but he's not, and that doesn't mean I don't really love Israel? 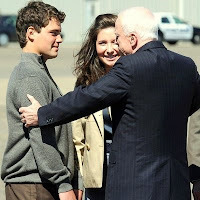 -- oh yeah, his name is Levi, so let's just say it sounds like the jeans instead -- anyway, to live with us as we protect the country from those who seek to destroy our way of life and fly over Alaska with their bomber missiles and submarines!" "But I get the most inspiration from my son Trig -- that's short for 'Trigonometry,' although he was sort of named before we knew about the whole Downs Syndrome thing because we had never even heard of it before he was born because we really needed someone to handle the bills in the family since Todd's writing arm is now lame from his accident. Trig has taught me that I don't have to answer 'gotcha' questions from the media or know this ancient history from the Supreme Court. Like him, I may smile and wink and occasionally spit up a little on stage, but gosh darn it, I'm an American and that should be good enough!" "I know that the American people will see that the wisdom I get from the great Palin family, as well as from other families from across this great land of ours, combined with the wonderfu l education I received from Hawaii Pacific College, North Idaho Community College, our homegrown Matanuska-Susitna Community College -- Go Grizzlies! -- and the University of Idaho, more than makes me qualified to work as a team with John McCain to make America even gooder!"